“But where shall we go?” the oldest son asked. So the next day the three sons chopped down trees. The oldest son’s tree fell pointing north. “That suits me!” he said, for he knew that to the north lay a farm where a very pretty girl lived. The tree of the second son when it fell pointed south. “That suits me!” the second son declared thinking of a girl that he had often danced with who lived on a farm to the south. The youngest son’s tree—the youngest son’s name was Veikko—when it fell pointed straight to the forest. They meant by this that only animals lived in the forest and they thought they were making a good joke at Veikko’s expense. But Veikko said he was perfectly willing to take his chances and go where his tree pointed. The older brothers went gaily off and presented their suits to the two farmers whose daughters they admired. Veikko, too, started off with brave front but after he had gone some distance in the forest his courage began to ebb. Just then he came to a little hut. He pushed open the door and went in. It was empty. To be sure there was a little mouse sitting on the table, daintily combing her whiskers, but a mouse of course doesn’t count. “There’s nobody here!” Veikko said aloud. The little mouse questioned him further and Veikko told her the whole story of his brothers and the trees. The mouse shook her little head solemnly. She was a dear dainty little mouse and as she sat looking up at Veikko with her little paws under her chin and her bright little eyes sparkling Veikko liked her more and more. At that the mouse made little squeaks of delight and she told him that she’d be true to him and wait for him no matter how long he was in returning. Well, the older brothers when they got home boasted loudly about their sweethearts. You see they were still having their little joke about foxes and wolves. “Gowned in velvet!” echoed the oldest brother with a frown. “Just like a princess!” the second brother sneered. “Huh!” grunted the older brothers not at all pleased that Veikko should have so grand a sweetheart. “Mine will be able to bake bread—I’m sure of that!” the oldest brother declared boastfully. “So will mine!” chorused the second brother. Of course he had no reason for supposing that the little mouse could bake bread and by the time he reached the hut in the forest he was feeling sad and discouraged. When he pushed open the door he found the little mouse as before seated on the table daintily combing her whiskers. At sight of Veikko she danced about with delight. Veikko was much surprised at this. “Well, I can!” the little mouse insisted. With that she began ringing a small silver bell, tinkle, tinkle, tinkle. Instantly there was the sound of hurrying footsteps, tiny scratchy footsteps, and hundreds of mice came running into the hut. All the mice scampered quickly away and soon returned one by one, each carrying a grain of the finest wheat. After that it was no trick at all for the Princess mouse to bake a beautiful loaf of wheaten bread. The next day the three brothers presented their father the loaves of their sweethearts’ baking. The oldest one had a loaf of rye bread. The loaf the second son had was made of barley. “Barley bread is also good,” the farmer said. At this the older brothers nearly exploded with envy until their father had to reprove them. The older brothers were delighted at this for they knew that their sweethearts were skilful weavers. “We’ll see how her ladyship fares this time!” they said, sure in their hearts that Veikko’s sweetheart, whoever she was, would not put them to shame with her weaving. Veikko, too, had serious doubts of the little mouse’s ability at the loom. “Whoever heard of a mouse that could weave?” he said to himself as he pushed open the door of the forest hut. “Oh, there you are at last!” the little mouse squeaked joyfully. She reached out her little paws in welcome and then in her excitement she began dancing about on the table. “Are you really glad to see me, little mouse?” Veikko asked. She rang the little silver bell, tinkle, tinkle, tinkle, and instantly there was the faint scratch-scratch of a hundred little feet as mice came running in from all directions and sat up on their haunches awaiting their Princess’ orders. The mice went scurrying off and soon they began returning one by one each bringing a fiber of flax. When they had spun the flax and carded it, the little mouse wove a beautiful piece of fine linen. It was so sheer that she was able when she folded it to put it into an empty nutshell. Veikko when he got home felt almost embarrassed for he was sure that his sweetheart’s weaving would shame his brothers. So at first he kept the nutshell hidden in his pocket. The sweetheart of the oldest brother had sent as a sample of her weaving a square of coarse cotton. The second brother’s sample was a square of cotton and linen mixed. “A little better,” the farmer said, nodding his head. Then he turned to Veikko. Veikko handed his father a nutshell at sight of which his brothers burst out laughing. But their laughter died as the farmer opened the nutshell and began shaking out a great web of the finest linen. So when he got to the hut he told the little mouse at once that his father wanted to see her. The little mouse was greatly excited. “I must go in proper style!” she said. She rang the little silver bell and ordered her coach and five. The coach when it came turned out to be an empty nutshell and the five prancing steeds that were drawing it were five black mice. The little mouse seated herself in the coach with a coachman mouse on the box in front of her and a footman mouse on the box behind her. “Oh, how my brothers will laugh!” thought Veikko. But he didn’t laugh. He walked beside the coach and told the little mouse not to be frightened, that he would take good care of her. His father, he told her, was a gentle old man and would be kind to her. When they left the forest they came to a river which was spanned by a foot bridge. Just as Veikko and the nutshell coach had reached the middle of the bridge, a man met them coming from the opposite direction. He stooped down and looked and then with a loud laugh he put out his foot and pushed the coach, the little mouse, her servants, and her five prancing steeds—all off the bridge and into the water below. The man thinking Veikko was crazy hurried away. Veikko with tears in his eyes looked down into the water. “She beckoned to Veikko.” Illustration by Jay Van Everen. 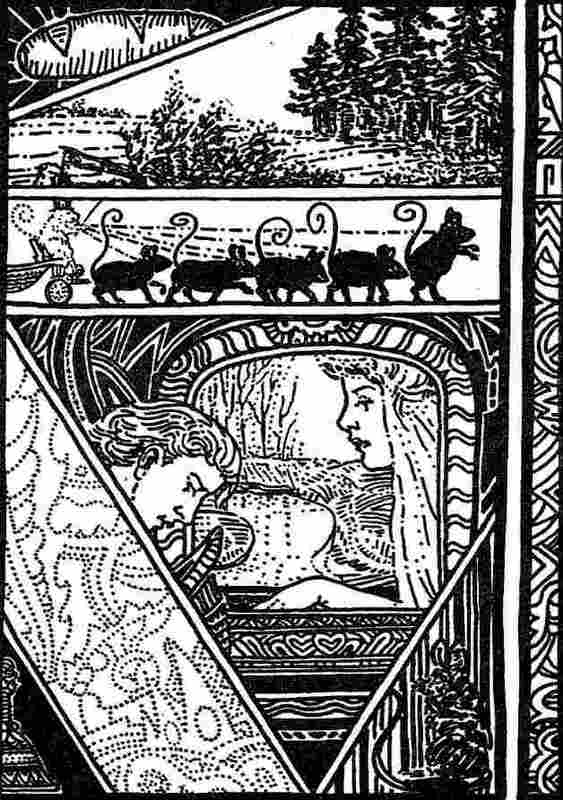 Published in Mighty Mikko: A Book of Finnish Fairy Tales and Folk Tales by Parker Filmore (1922), Harcourt, Brace and Company. “Me? Me?” Veikko stammered, too dazed to think. And that’s exactly what they did. They drove at once to the farmer’s house and when Veikko’s father and his brothers and his brothers’ sweethearts saw the Princess’ coach stopping at their gate they all came out bowing and scraping to see what such grand folk could want of them. The farmer stopped bowing long enough to look up. But they were wrong: it wasn’t because his tree pointed to the forest that Veikko got the Princess, it was because he was so simple and good that he was kind even to a little mouse. Well, after they had got the farmer’s blessing they rode home to the Princess’ kingdom and were married. And they were happy as they should have been for they were good and true to each other and they loved each other dearly.